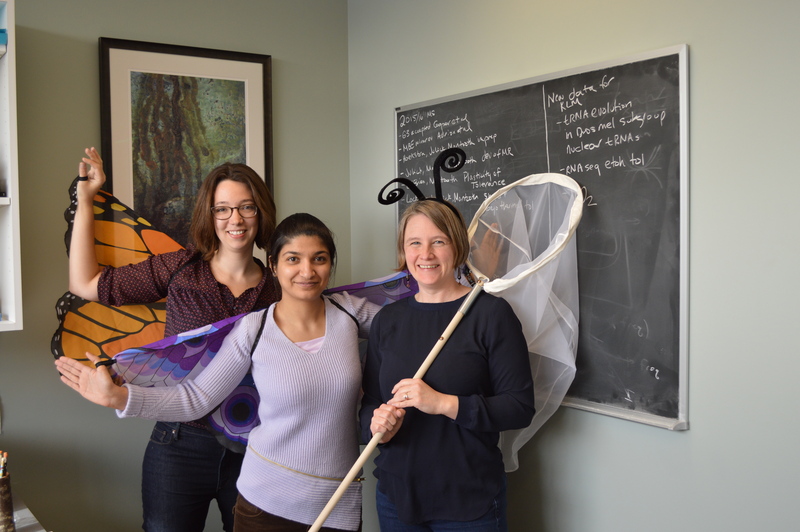 (From left) Katherine O'Brien and Omera Matoo, postdoctoral researchers in biology at UNL; and Kristi Montooth, associate professor of biology at UNL, will lead visitors in activities to explore evolution during Sunday with a Scientist Feb. 21 at Morrill Hall. The University of Nebraska State Museum's February Sunday with a Scientist program for children and families will investigate the diversity of evolution through exploration of species with wings. The event will be from 1:30 to 4:30 p.m. Feb. 21 at Morrill Hall, south of 14th and Vine streets. Activities will focus on the diverse functions of wings in pigeons, flies, butterflies and more. Kristi Montooth, associate professor of biology at the University of Nebraska-Lincoln; Katherine O'Brien and Omera Matoo, postdoctoral researchers in biology at UNL; and graduate and undergraduate students will lead visitors in activities to explore evolution. Hands-on discovery will center on "evolution of the wing" and take a close look at wings of various species and the functions they serve. Children and families can play "Pigeonetics," an interactive pigeon-breeding game; mix and match blocks to create their own pigeons; dress up like a bird and make their own bird mask; and participate in a coloring project to learn about the diversity of patterns in butterflies.